Last week, I was just debating whether I should treat myself to lunch in town. Well I'm glad I did that, because a lunch means much more! After my lunch, I popped by into an upscale patisserie shop and am dazzled by the christmas bakery goodies. I asked if I could take one of their product catalogue, and the lady said I could. I also spent some time looking at their real life bakery display. Made a mental note that I need to come back here to get some christmas gift for a friend. On my way back, I just could not stop thinking about the goodies...and I started thinking of how I should make them, in 1:12 dollhouse miniature scale. 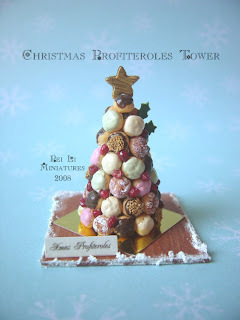 I spent the rest of the week creating this 1:12 scale dollhouse miniature christmas profiteroles tower. This took some time, as I had to make different "flavoured" ones - chocolate, pistachio, vanilla, strawberry, sugar coated and chocolate with peanuts. Strawberries are also randomly inserted in between the profiteroles. This has been quite a fruitful week for me. I worked on many little projects, accomplished some new desserts, and will be listing them on my etsy store slowly. I also worked on some new 1:12 miniature scale cupcake creations! 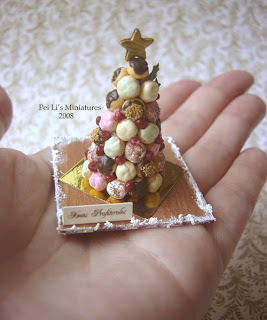 I love to look at real cupcake creations and think of ways to create them in 1:12 scale miniatures. A few weeks ago, I came across the butterfly cupcakes. Actually it's 2 sugar cookies planted sideways on top of some cream. In the middle, they added strawberries on it. I was quite attracted by it, and so I attempted to make them earlier this week. I've not decided what I will put on the top tier, but I think the cupcakes look good on the bottom tier. On an another note, I have some wild ideas in my head...and I am opening up this offer to brick and mortar shop owners. Would you like to have my cake/bakery display shelf in your physical shop? I am looking for exposure opportunities, and some of the places you can place this is at your cashier's counter. These unique items by itself give character to a room/shop, draws attention only to the observant, and inspire conversation when displayed. We can work out the details. Leave me a comment if you would like to explore this idea! I'll get back to you! I spent the weekend making a YouTube video on my 1:12 scale dollhouse miniatures. I can't think of a better way to put my favourite music with photos of my work together. I like the overall effect. I like something light hearted, and this song is just perfect. I also have many other music on my favourite playlist, but we will have to wait till I have enough snapshots of my work to make another video. It wasn't too hard making the video, but I was quite picky with editing and making sure things sync, so I ended up spending almost 2 whole days on it. I haven't finish labelling the purple soaps, but wanted to take a photo of this work in progress. Each soap is individually wrapped, as you can see. I like that effect of how new and clean the soaps look. Labels add an elegant touch. A soap in between my fingers give perspective of the 1:12 miniature scale. Thanks to all of you who have participated in my last week's giveaway contest. During the week, I continued to scout for more biscuit/cookie covers and made some more. And I manage to make another set, so I have 2 sets to give away! If you could take a photo to show me how the 1:12 miniature biscuit boxes were being used, it would be so wonderful! I love to see my creations in your dollhouse, etc. As you can see, the 2nd set is slightly different from the first set. I managed to find a Ritz Roasted Vegetable crackers photo and made it into a 1:12 miniature box too. For the rest, please do not worry! I'm in the midst of finding and making some more wonderful goodies and will include another giveaway in the near future. In fact, please leave me a comment if you can recall a brand of cookie/shortbread/biscuits which comes in elegant box branding/packaging. I can only remember walkers brand, LU as well, but am certain there are some more other beautiful packaging. I'll try to look it up to see what I can do with it. Thanks in advance!